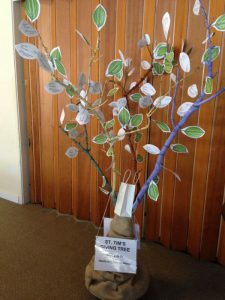 The Giving Tree is our method to highlight needs/opportunities and continue to fund the various ministries at St. Tim’s.To participate in the St. Tim’s Giving Tree project, simply select a leaf and an envelope, then place your donation (checks with “Giving Tree” in the memo line, or cash) and the leaf (with your name and phone number written on the back) into the collection plate. You can also send your donation to the St. Tim’s office, or you may make a Donation by selecting the “Donate” button on this page. We appreciate your current giving and every little bit extra through the Giving Tree project helps us fund the ways we are the hands, face and heart of Jesus in our community. This project raised almost $25,000 to close the church’s budget gap and for ministries in 2015. Remember, there are multiple ways to participate – cash, check, web donation, increasing our pledges, and using eScrip and AmazonSmile when we make purchases. Again, we are so grateful for these donations, and look forward to your support of the many important “leaf ministries” that still need attention.